or online through our website today! Day after day, the guests to your zoo come and go, delight and awe upon their faces. Your plan was perfect; your monorails provide easy access to your carefully structured attractions and enclosures, and your topiary provided a cool, shady place to rest. In the back of your mind, however, you know there is more you could provide. Advanced technology? Trip souvenirs or more travel accommodations? You smile as a thought occurs; perhaps what your zoo deserves is the king of all exhibits…the mighty T-Rex. 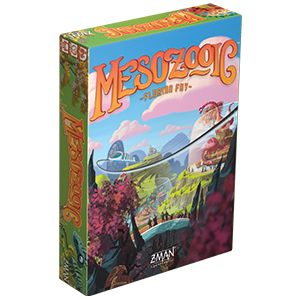 In Mesozooic, you choose cards, build your zoo, and score points in a frantic and fun real-time game. Mesozooic is available for preorder now through our website or your local retailer and will be available in stores in Q4. We previously discussed the real-time gameplay of how to create your zoo, as well as the different features you can draft and how they score. 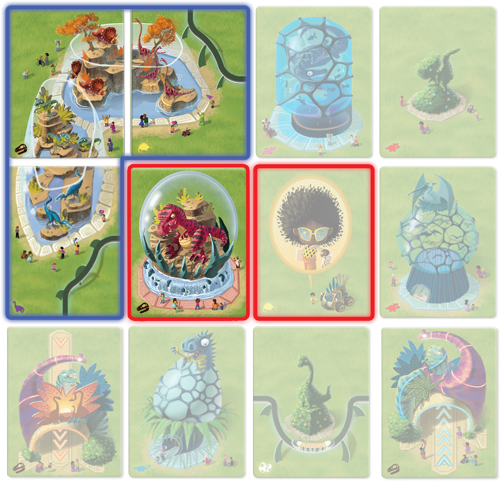 Today we reveal how a masterful director can upgrade their zoo: the advanced cards. Give your guests easier access to various parts of your zoo with strategically placed gates. There are two types of gates, marked with arrows and colors. Blue gates must be placed in the top row of the zoo, while orange gates must be placed on the bottom row. Each gate can be placed in any spot of the correct row. The blue gate can be in the top left corner or in the middle of the top row. Each gate that is correctly placed will score 3 points. Provide your guests with mementos of their visit to your zoo with the a trip to the gift shop! Leave with dinosaur plushies, posters, and more to remember the exciting day at the zoo. The gift shop must be placed in one of the four corners of your zoo to score. Each gift shop scores 4 points. Simple but powerful, the double enclosure card efficiently uses your limited zoo space, allowing you to complete herbivore and carnivore enclosures right next to each other with just three cards instead of the usual four. Each enclosure will then score 6 points, grabbing you a total of 12 points for just the three cards if you can match them up! The awe-inspiring Tyrannosaurus Rex is a monumental addition to any zoo, drawing crowds from far and wide. But the king of dinosaurs wants to be the center of attention. The T-Rex exhibit must be placed in one of the center two spaces of your zoo. If you can slide the T-Rex into the center then the king of dinosaurs will score 5 points. Give your guests a sneak peek of your zoo upgrade plans with the VR simulator. When scoring, the VR simulator becomes an exact copy of a card next to it. Clever placement of this card and those surrounding it can lead to some very impressive scoring opportunities. Your VR simulator could copy a T-Rex if it’s in the right place in the middle of your zoo. Or maybe the VR simulator copies a monorail to form a new connection and score more points. You choose which orthogonal card the VR simulator will copy to get the most points. Hone your skills as a director and build the most enthralling dino zoo. Preorder your copy of Mesozooic today! © 2019 Z-Man Games. Z-Man Games is an ® of Z-Man Games. The Z-Man logo is a TM of Z-Man Games. All rights reserved.